Until when we will say RIP and forget it. Until when we’ll condemn and forget it. 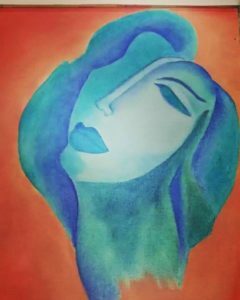 Until when we’ll express ourselves in words with sadness and forget it. Is there any one to get us out before it’s too late. We lost Salim because of the lack of proper treatment and negligence by the Australian government. His death, and many others who died on Manus, was preventable. 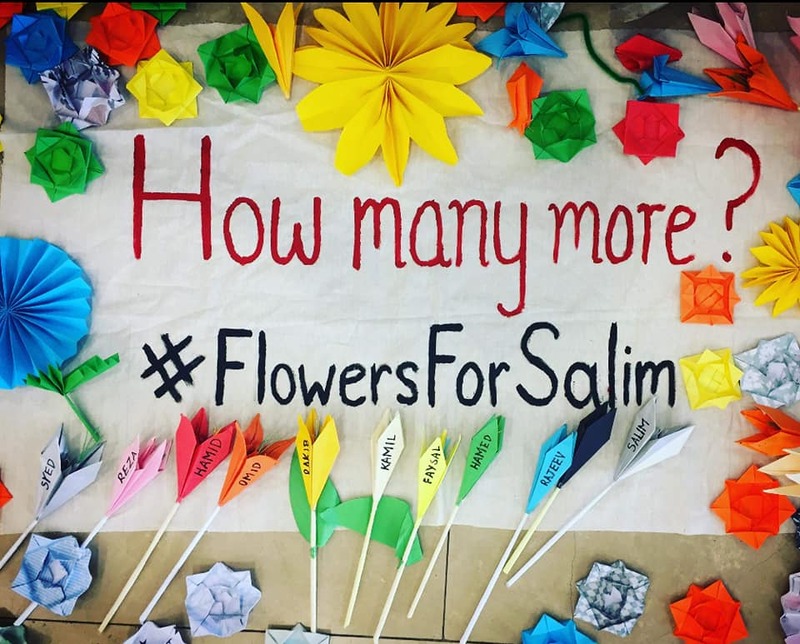 Every single person on Manus as a worker or detainee was aware of Salim’s serious health issues. I wish the Australian government had allowed him a sudden death instead of the agonisingly slow death he experienced. It is the 21st century and Australia is actually wasting its’ taxpayers money like water to make human beings suffer to such an extent. Documentation has been made and history will record the Australian government’s actions, what they made him endure and which eventually caused his death. In the meantime, I would like to express my deep gratitude to all my brothers on Manus Island and every single Australian who showed their solidarity, expressed their condolences and stood up against this inhumane action. Although Salim is not among us anymore, he is still remembered and alive through many hearts. This is the human spirit and I thank everyone again for keeping this power alive. I didn’t know Fariborz, yet every part of my body knows the system which has taken his precious life. 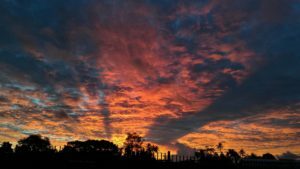 The system the Australian government has designed for refugees and asylum seekers, has a kind of evil and devastating effect. It can ruin the very inner strength of human spirit. To the outsider, Fariborz took his own life, but the truth is the system took his life. There is no alternative explanation, and we must hold the Australian government accountable for this action. 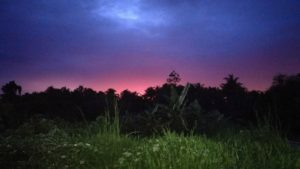 Even though I am now safely in America, the experiences I suffered on Manus are always on my mind and bind me to Australia. I will use every opportunity to record the barbaric acts towards fragile refugees and asylum seekers. is an exhibition of art work by photographer ‘Kaaveh Maleknia’. 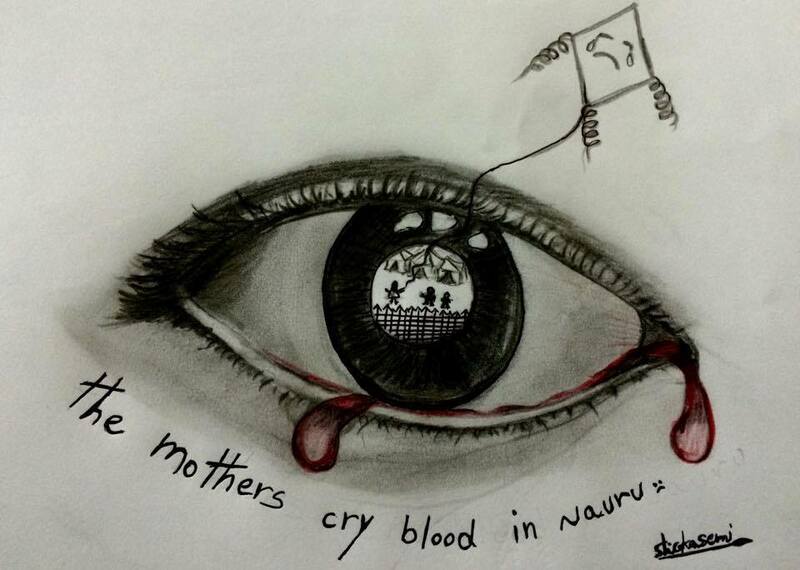 ‘An artist/photographer from Iran has been suffering island imprisonment in Manus since 2013. “Kaaveh Maleknia” hasn’t lost his skills but something has changed in him forever. 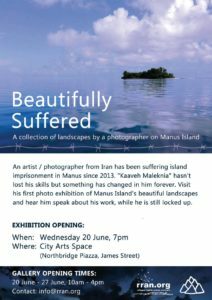 Visit his first photo exhibition of Manus Island’s beautiful landscapes and hear him speak about his work, while he is locked up’. 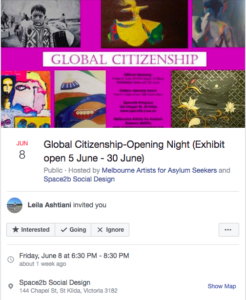 Exhibition Opening: Wednesday 20 June 7pm @ City Arts Space, Northbridge Piazza, James Street, WA. See My Humanity is an exhibition of paintings by Nasir Moradi. 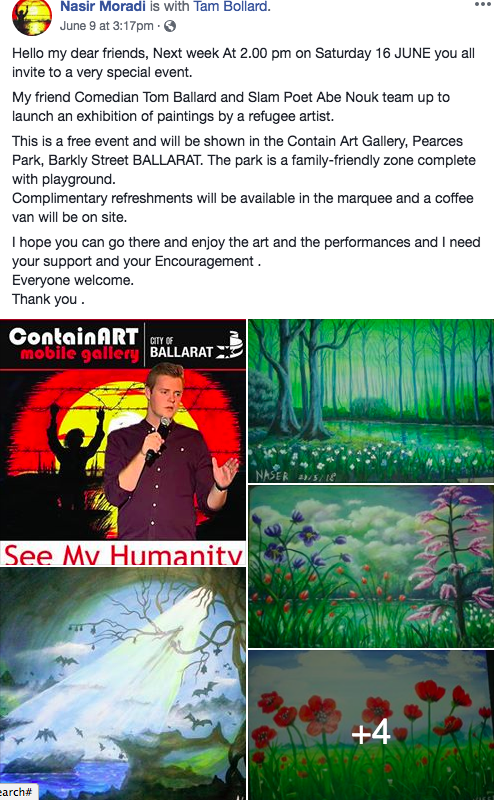 Opened by Tom Ballard and Abe Nouk 2pm 16th June 2018. 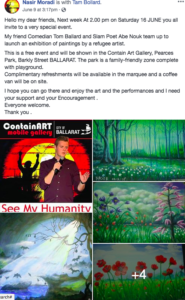 It is a free event shown in the Contain Art Gallery, Pearces Park, Barkly Street, Ballarat, Victoria. The exhibition is based on the idea that a person’s identity transcends geographical and political borders and comes from the membership of a broader class called ‘humanity’. Everyone has rights and responsibilities as part of being a civic member of the world, beyond the citizenship to a specific nation. There will be an engaging talk with drinks and nibbles on the night. Everyone is welcome so please invite family and friends to come along. 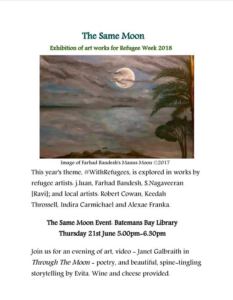 The exhibition is open at Space2b Artspace from Tue 5 June to Fri 30 June so please drop in to view the exhibit during our open times. This year’s theme, #WithRefugees, is explored in works by artists who are refugees: j.luan, Farhad Bandesh, S. Nagaveerab (Ravi) and local artists; Robert Cowan, Keedah Throssell, Indira Carmichael and Alexae Franka. With’Through the Moon’, a Writing Through Fences video, and story-telling by Evita. We will re-start living in the heart of beautiful, calm and clean nature without being surrounded with black, despicable high fences and closed metallic doors and sharp- barbed wires. 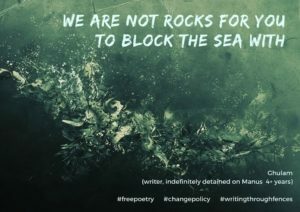 My heartfelt clear message to the rest of my brothers still detained in the corner of dark detention centres in Indonesia and across the world. Hunter Asylum Advocacy held a launch of ‘The Strong Sunflower – an Illustrated Poem’ by Mohammad Ali Maleki in Newcastle, speaking with Mohammad and Mansour Shoshtari. 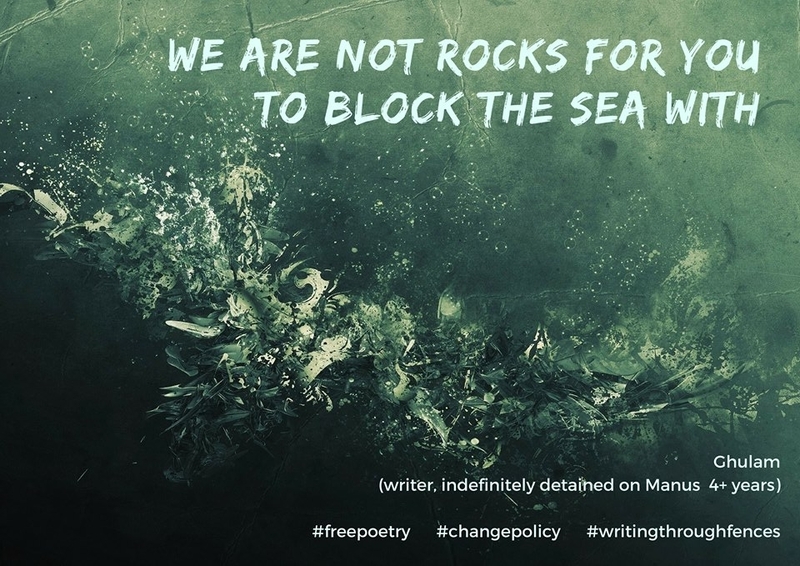 They also performed a recital of ‘Freedom,Only Freedom’ – from the freepoetry project a collaboration between Voices from the Human Dumping Grounds and Writing Through Fences. 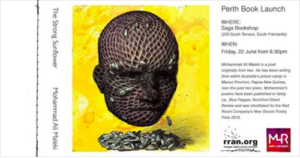 You can find the pack for this recital on our website under freepoetry.